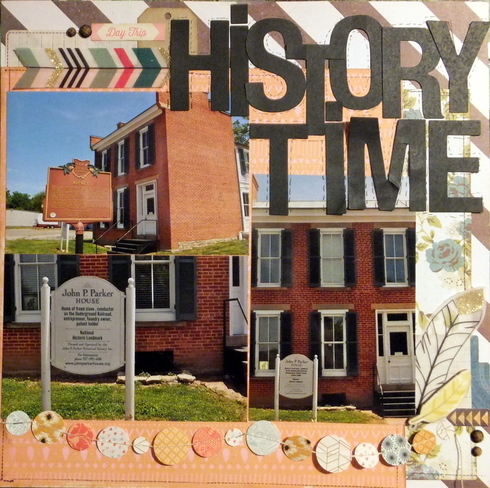 Titles are taking over our layouts for this month’s Kit-Inspired challenge! Inspired by the alphas by Fancy Pants in the Make it Happen kit, our latest challenge is to create a layout with a big title. For added impact, Rebecca adhered her letters with pop dots. And doesn’t that watercolor wave look great, too? From the creative spelling (and great use of asterisks for hyphens!) to the doodle-esque outlining, Jennifer’s title is a standout, too! 1. Create a layout with a large and in charge title. We would love to see a Scrapbook Circle kit in action, but any materials will do. Both layouts are awesome!! Love how you got all those photos on them and the big titles are so cool!! Great challenge!! here’s my big titled page! thanks for the inspiration and fun challenge. Here is mine and thank you for all the great challenges!